2. The iPad does not have a camera, nor can you make phone calls–this is more of a consumer device than a production machine. While it has an auxiliary keyboard, it brings us back to word-processing without all the other complementary media that we can produce. So is this actually a revolutionary device, or one bringing us backwards? 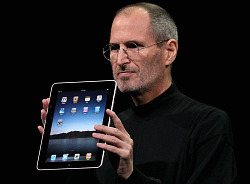 Maybe it’s too early to tell, and I certainly have not tried an iPad, but from reading various reports it seems like we have gone from the earlier versions of Apple, allowing us to make music, edit video, use a webcam, etc., to a platform which is good at receiving stuff. Can it be all in the apps to come? Now it’s up to the “content makers” to move us along–and not just provide us with more of the same. While I have nothing at all against getting good movies and books on my iPad, wasn’t this supposed to be a “new media” revolution? This was written by fredritchin. Posted on Wednesday, January 27, 2010, at 9:19 pm. Filed under New Technologies. Tagged iPad. Bookmark the permalink. Follow comments here with the RSS feed. Post a comment or leave a trackback.